I knew I wanted to share this idea with you but I was holding off for some reason. Maybe it’s because I recently posted about squash, but we LOVE squash!! I’m super excited to be a part of the Paint Chip Pals Rainbow-Tastic Holiday blog hop which supports a fun and exciting Kickstarter campaign. The Paint Chip Pals plush dolls – a colorful set of characters saving the world from blah one color at a time! Learn more about this exciting campaign and the creators Andrea and Cliff Currie (whom you may recognize from Hand Make My Day and Craft Wars) here! I love all the Paint Chip Pals for their bright hues and unique personalities I naturally honed in on the chef OrAngie as the inspiration for this squashie project because I like her fireyness and off the hook kitchen skills. When I was contacted recently by The Paint Chip Pals to do a blog post, I knew this was the one for them. I saw OrAngie the cute Paint Chip chef who loves making Orangie cupcakes and mini yam sandwiches and fell in love! We try to be as creative as we can over here and the Paint Chip Pals fall right into our category for fun! “How can squash be fun?” you ask. Well first off when I was looking at the photos of this pretty Orange Acorn squash my first thought was it looks a bit like OrAngie! It’s orange, and has a pretty little scalloped edge. If it had arms it would probably reach out for a hug, it’s like a little baby OrAngie. See how cute she is, do you see a resemblance? If you have never made Acorn Squash before it is the easiest side dish to make and is sure to impress your guests! Don’t you want some Ohhh’s and Ahhh’s at the table once in a while? (You know you do) Now I didn’t learn to make this at culinary school or on a cooking show, this is just how mom used to make it, simple, comforting, buttery and sweet. I did however come up with this brilliant microwave steaming method to cut cooking time…all by myself! Now go to the store and buy some acorn squash, when you get back I will tell you what to do with this prehistoric looking food. 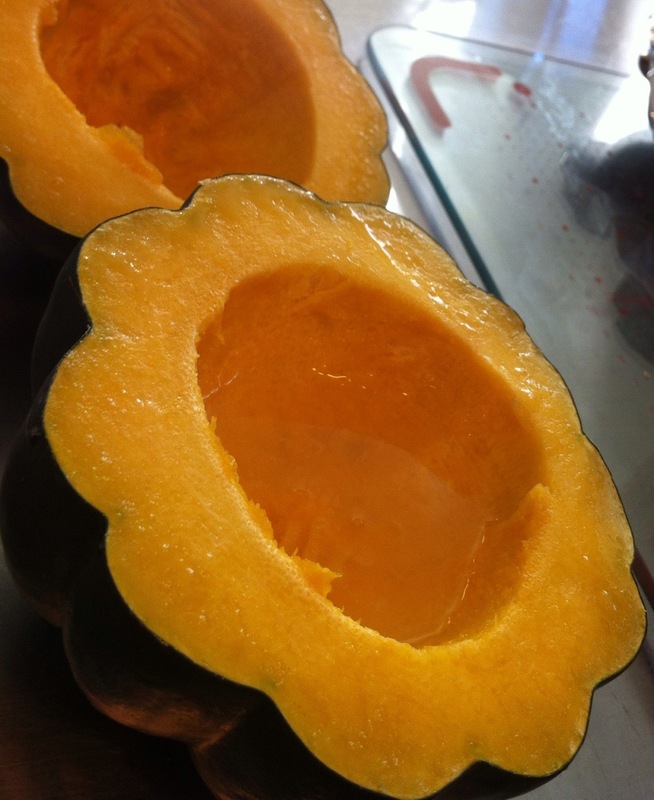 Wash squash with water, dry. Scoop all the seeds and pulp out of the center. Pour 1/2 the water into the bottom half of each squash, place top of squash back on top. 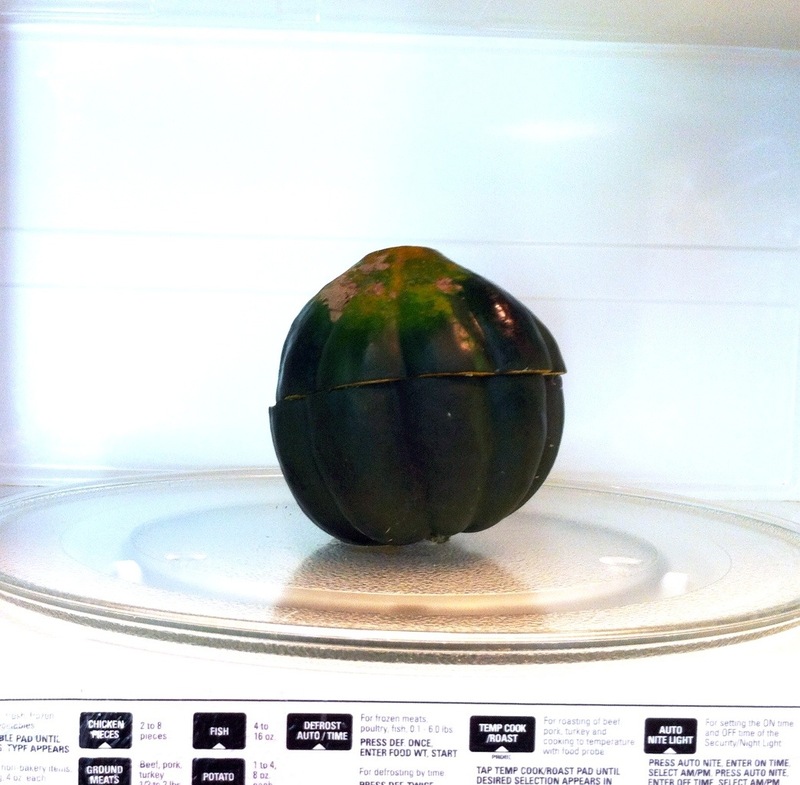 (see photo) Place the squash in the microwave for 5 minutes on high. It is now steaming, when you remove it use caution not to get a steam burn. 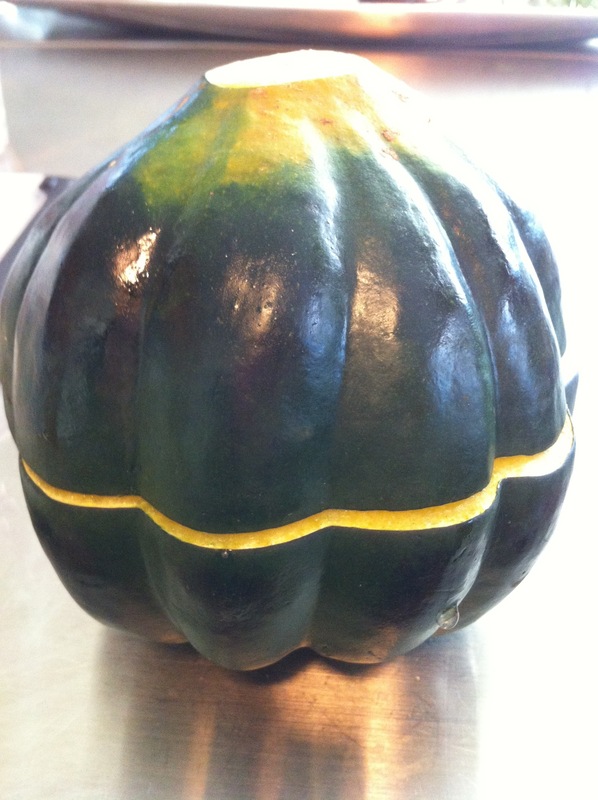 The squash should be tender when poked with a knife. If it is not, return it to the microwave. 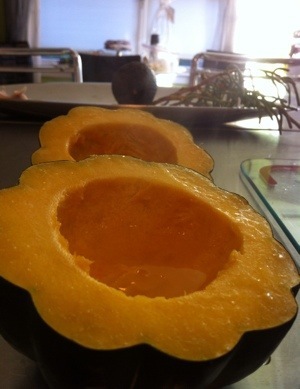 Dump out any remaining water; place the squash on a baking sheet. 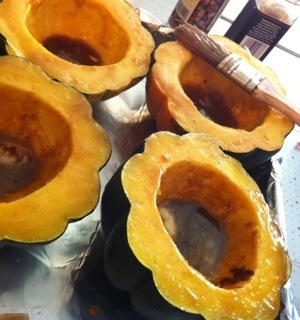 Add 1 Tbs butter, 1 Tbs brown sugar, 1 Tbs maple syrup and a pinch of salt to the flesh of each squash. Lightly poke each one with a fork a few times to let the butter and sugar sink in. Cook for 15 minutes or until bubbly and tender, let cool 5 minutes, serve. * sharp knife – If the squash is too tough to cut through or you are afraid of slipping place it in the microwave for 2 minutes to soften. The Paint Chip Pals Kickstarter Campaign!